That was an appropriate description. In that era, the term “Supper Club” usually referred to a small, somewhat upscale establishment that was open till the wee hours offering live entertainment and beverages. Food was available but was often a low priority. Supper clubs and night clubs operated in a similar way, bringing affordable live music to downtowns all over the country. Rock Island nightspots, with names like Buvette, Mardi Gras, Rockaway, Paddock, Horseshoe, Arrow Club and the old Dutch Inn, are a source of fond memories for many. In addition to the music, they were a social place where patrons would dress up for a night out. Although a cocktail dress and hat would be completely out of place in most modern establishments, such outfits would fit right in here. 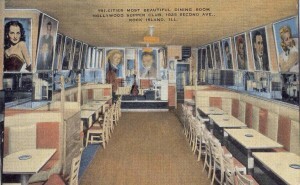 On the 1940s card, the view looks toward the front door and shows the walls lined with large pictures of Hollywood stars of the era. The curved bar seems to dominate the long narrow storefront at 1825 Second Avenue, one of several street level businesses in the historic 1874 Star Block building. The first business at the 1825 address was Louis Schmidt’s barber shop. By 1929, Odell’s Inn began the long tenure of food and drink establishments. Woody Cather and his wife, Verna, opened the first Hollywood Supper Club at 4600 9th Street in the mid 1930s, but a few years later moved their business downtown. 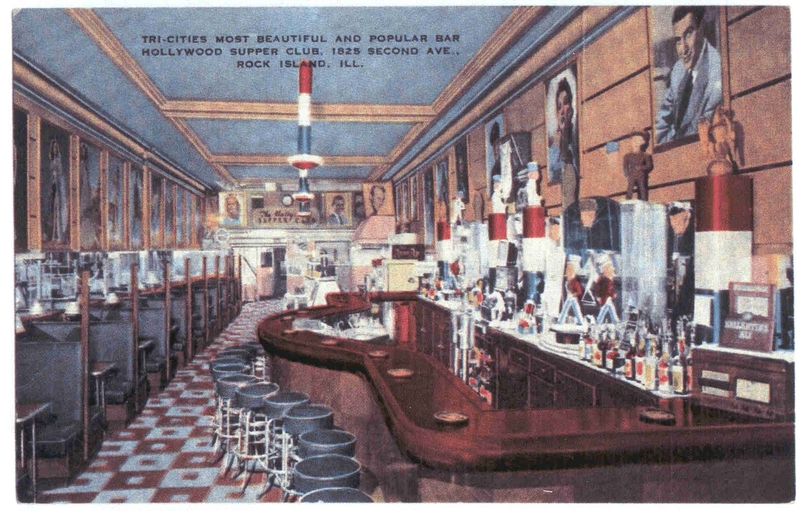 Seating is in intimate booths with both the tables and the bar stools in an Art Deco chrome. The ceiling, probably embossed metal, has deep coved molding as well as ornamental beams. This ornate ceiling was probably original to the Star Block. After the war, there were changes in both the interior and the slogan. A second postcard, from the collection of CCCC Greg Binder, dates from about 1950. Now the Hollywood is called “Tri-Cities’ most beautiful dining room.” This view, looking toward the rear of the building, shows that the booths have disappeared, replaced with small tables placed lengthwise at at a continuous long wall bench. The movie star glamour shots remain and a small band stage can be seen at the distant wall with an equally small dance floor in front of it. The tables are situated to create a wide main aisle that would accommodate dancing in the wee hours as well. The most drastic change appears in the dropped ceiling, which covered the historic metal one. In 1956 ads, Woody boasted the Hollywood was the most popular restaurant and nightclub in the area offering the finest charcoal broiled steaks as well as continuous nightly entertainment. A year later, he announced that he would open the “Paradise Room” in an adjacent storefront. By the late 1960s, local restaurateur Nick Chirikos had taken over the former Hollywood and redubbed it “The Nic.” In 1970, baseball hero Gene Oliver opened a new night spot, “The Bullpen.” Today it remains a restaurant, now specializing in Chinese cuisine. This article by Diane Oestreich is slightly modified from the original, which appeared in the Rock Island Argus and Moline Dispatch on January 7, 2007.